Are high summer like temperatures keeping you from baking dessert lately? 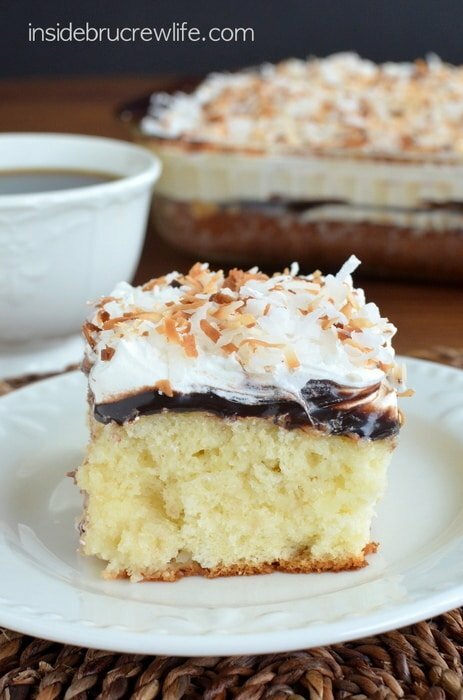 This Coconut Eclair Cake is just what you need to keep cool during this heat wave. Last week we had some beautiful fall days here. It was slightly cool and just perfect for wearing jeans and sweatshirts with flip flops. Do you do that too? It is my favorite. But that was just a teaser because this week has been crazy hot. Like hotter than the entire summer vacation! They even cancelled my son’s soccer game because the heat index was supposed to reach 112*. That’s crazy hot! Now usually that kind of heat doesn’t bother me because I stay inside with my air conditioner cranked down low. But our air conditioner was even having a hard time keeping the house cooler in these temperatures. The other day I was at Meijer when I saw some new fun frostings from Betty Crocker. Of course the Almond Joy one caught my eye right away. I do love me some coconut. 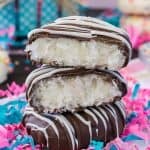 Have you seen these Coconut Muffin Tops or this Coconut Oreo Fudge? Putting coconut into everything is kind of my life long dream. Unfortunately not everyone in my house agrees with this mission, so I limit my coconut baking to here and there. But the minute I laid eyes on this Almond Joy frosting, I knew it had to come home and live with me. Into the cart it went, and we went happily home to bake in the heat. Now obviously since the air conditioner was struggling to keep up with the heat outside, I didn’t want to add heat inside too. 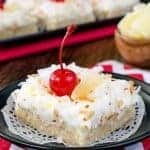 This Coconut Eclair Cake is just like the original version, but with a few fun tropical twists that I happen to love. Actually I am loving on it a little too much lately. There is still a few pieces in my fridge…someone please come take them away before I dig in again. I used Jello instant coconut cream pudding with more shredded coconut stirred in. Like I said I love all things coconut! Then the entire thing got covered in the Almond Joy frosting…which is heaven. It is good with those leftover crackers too…or so I hear. 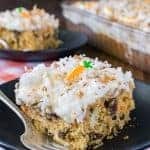 The finishing touch to this cake is serving it with toasted coconut and Almond Joy pieces…just adds a little bit more color and fun to an easy cake. 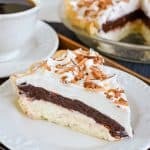 If you can’t find me later today, it’s because I’m hiding from the heat with a huge piece of cold Coconut Eclair Cake to keep me company. I guess I am ok with summer holding on, as long as I can keep enjoying no bake desserts! 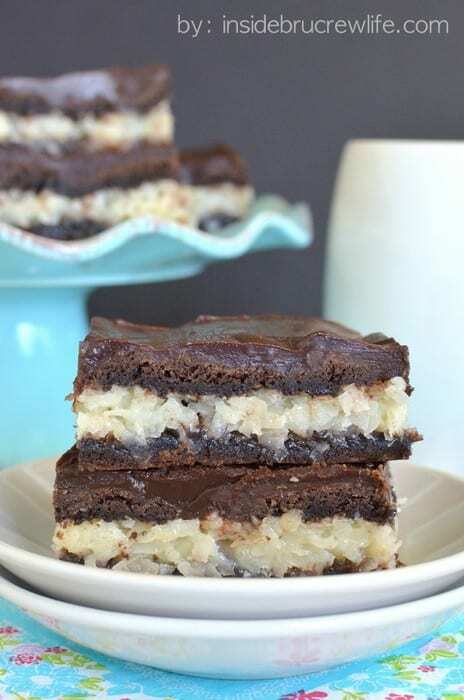 Chocolate crackers and coconut pudding come together to make an impressive no bake dessert. In a mixing bowl, whisk together the pudding mix and milk. Stir in the shredded coconut. Fold in the Cool Whip gently. Place a layer of the chocolate graham crackers on the bottom of an 8x8 pan that has been sprayed with non stick spray. Spoon half the pudding mixture over the crackers. Top with another layer of crackers. Cover with the rest of the pudding. End with one more layer of crackers. Place the frosting in the microwave for 20 seconds. Pour over the top of the crackers and spread out. Refrigerate until firm. Cut into 9 squares. 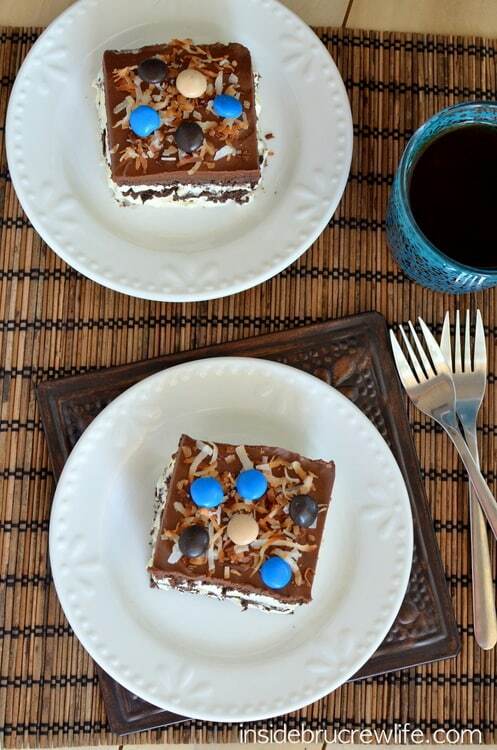 Top with toasted coconut and Almond Joy pieces to serve. If you use a dish with rounded edges, you may need to break a few crackers to fill the bottom of the pan and to top the pudding. Okay confession time. I don’t do coconut! I never like it as a kid and I even tried some muffins my friend made last week because they looked so good. But they had coconut in them. I think I could do the flavor but not the actual coconut pieces. It’s a texture thing! You cake looks tempting though…. No coconut?? I can’t even imagine! 😉 I guess that’s how people feel when I say I don’t really care for meat! Lol! Thanks Nancy! Flavoring and/or grind coconut very finely. I don’t care for the texture either. It was seriously lovely-almost a dessert in itself!! Hehe! I’m glad you’re getting nice Fall weather! Thank goodness it cooled off here again! The heat wave was weird!! Yay!! Then you should totally make this!! 🙂 Thanks Ashley!! 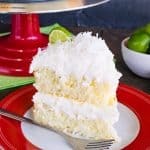 mmmm i am a lover of all things coconut too, this sounds so good! Please send me those last few pieces of this! This is like a coconut dream. 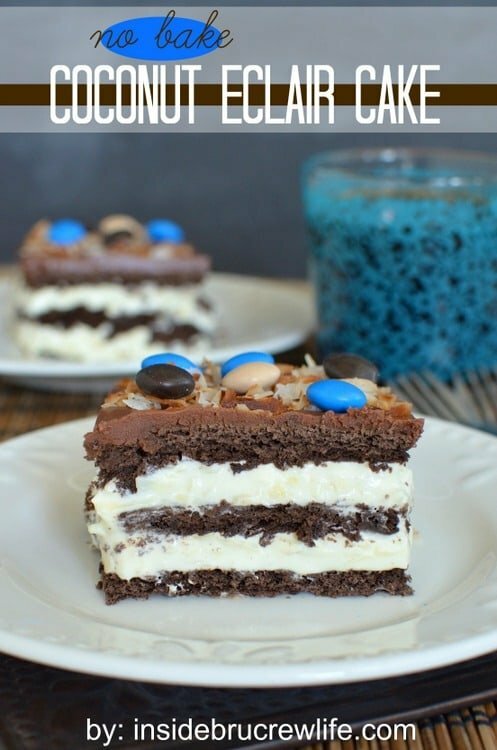 I love Almond Joy inspired desserts, and have been dreaming up my own concoctions, which don’t even compare to this! Love it. Thanks Marcie!! 😉 I’m sure your recipe ideas are totally drool worthy! Love your baking girl!! That looks good! I don’t normally buy canned frosting though because I would end up eating it by the spoonful. It’s so good. 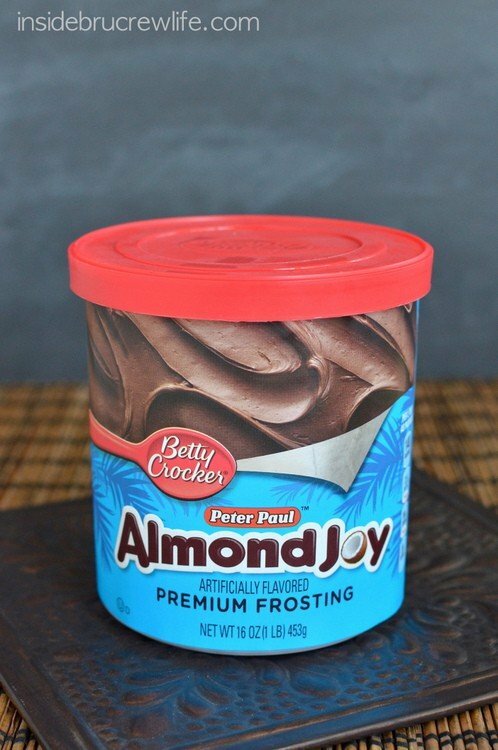 I’m pretty sure i could eat that almost joy frosting in one sitting. 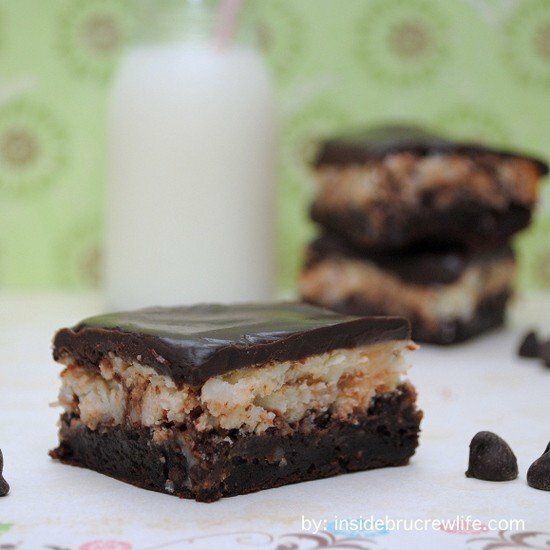 Almond Joy candy bars are one of my favorites. Yum. I might have eaten a spoonful or four during the frosting of this! 😉 They are one of my favorite candy bars too! Thanks Vanessa!! Oh this is just awesomeness. I fell in love with Almond Joy about 5 years ago. I didn’t like them for the longest time. In fact, I didn’t like coconut for the longest time, then I woke up and realized coconut is pure deliciousness. The end. 🙂 (pinning these). Mmm I have been dying to try that frosting! This cake is fabulous. It’s SO HOT HERE. I’m so ready for cooler weather and pants! This frosting is thee best!! It’s FINALLY cool here again. The heat wave we had was so weird! I will try to send you some cooler weather!! 😉 Thanks Dorothy!! I love how simple this cake looks and it is one of my favorite flavor combinations! I forget how great chocolate graham crackers are! 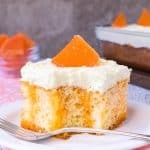 There is no way that I will make this for my hubby! OK, I lied … I will make it for a family potluck … so we won’t be tempted to eat the whole thing!!! Haha!! I seriously wanted to devour this all by myself!! Thank goodness I have three hungry kids and friends who take things off my hands! Thanks Brenda!! Wow, that is hot!! It is total fall weather here, so I cannot even imagine! Just wow! This cake would be the perfect thing to keep cool though! I am loving that frosting! Yes, it was no fun!! This cake helped a lot! 🙂 Thank you girl!! I totally think this cake could convert you!! 😉 Thanks Kelly!! I feel you! It’s been 100s here as well. 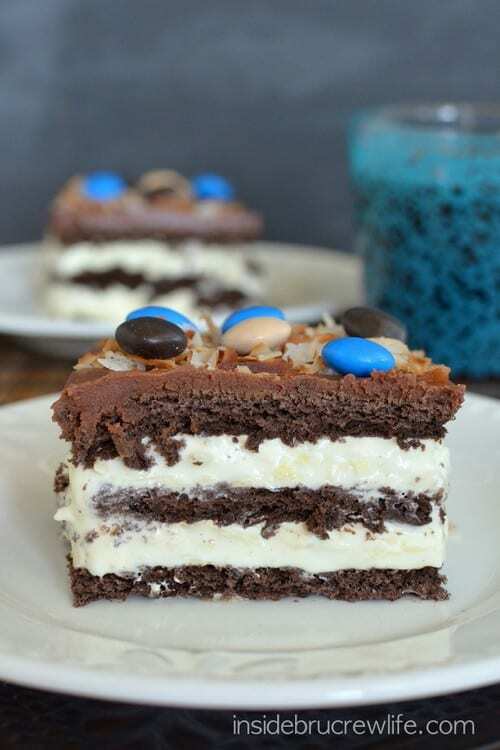 Love the blue in these pictures and having major coconut withdrawals – must have some soon! And that frosting! All of it looks so good! Yuck! I hope your weather has cooled off! You need this cake to help with that withdrawal 😉 Thanks Mary!! Oooh! Ooh! Ooh! I grabbed that frosting a couple weeks ago but haven’t used it yet! Now I know what it’ll be for 🙂 this looks AWESOME. I don’t know he you’ve hung on to it that long! I could barely wait to taste it!! 😉 Thanks Hayley!! I am off to hunt down chocolate graham crackers. Thanks, Jocelyn! I hope you’re finally getting relief from the nasty heat! Haha-“You turn per-made into home made flair”-love this!! 😉 Thank you so much Wendy!! I LOVE coconut! Maybe it runs in the family? Love this recipe! Haha, it probably does!! 😉 So does caving sugary goodness!! Thank you Mom!! I havent’ seen that frosting – on the look out on my next trip to the grocery store. It’s so insanely good.. Like eat out of the container good!! 😉 I hope you find it!! 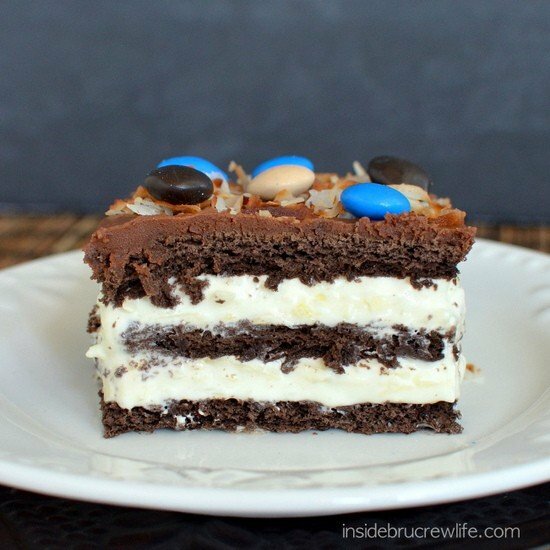 Oh my coworker made eclair cake similar to this but I think it was with banana. Love the coconut twist with this! Mmmm, banana eclair.. Sounds dreamy 😉 Thanks Carla!! We’ve still had hot weather here, too…fingers crossed that we’ll get some cooler temps soon. In the meantime, I’ll just eat this cake to stay cool – I can’t get that frosting out of my mind!! Yuck! Come on Fall, everyone is ready!! 😉 This frosting is now one of my fav’s!! Thanks Ashley!! What a fun cake. I wish my family liked to eat coconut a bit more. I’m in love with it. Poor you! You just need to make this for yourself then!! 😉 Thanks girl! Interesting new frosting! This looks amazing! Thanks Kristen!! The frosting is one of my new favorites!